During the Data, Mapping, and Research Justice workshop offered in August, participants conducted their own data collection based on shared research questions about the Cass Corridor. 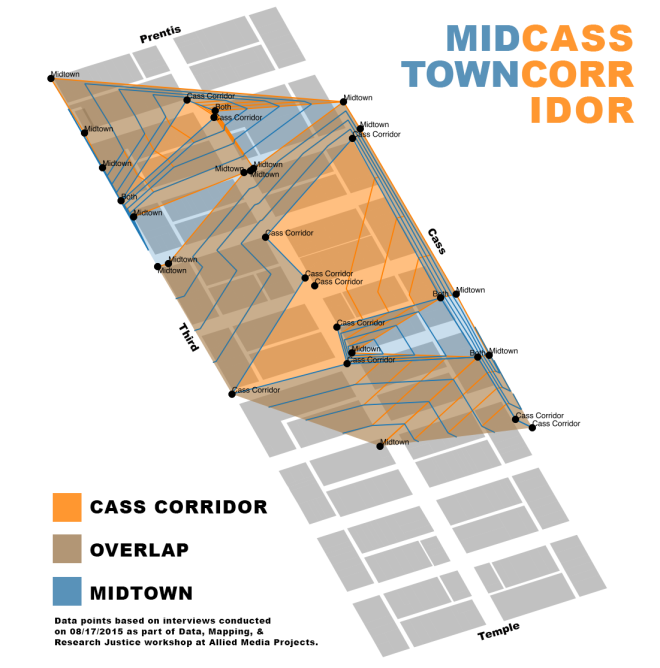 One question in particular that was brought up was what different people called the area: Cass Corridor or Midtown. In all 30 people were rapidly interviewed along Cass Avenue, 2nd, and Third Street. Sometimes the workshop participants’ data collection clipboards made people wary, but often the clipboards invited more questions making it easy to engage people on the street, at restaurants, and waiting for the bus. The participants didn’t make it further than Peterboro Street due to time limits in the data collection.